The idyllic little Leitgeringer See is set in the rolling countryside of the northern Chiemgau. The shoreline, with bays and promontories, is bordered by deciduous trees and reed beds. With an area of around 0,15 km² and a depth of up to 14.5 metres, the lake is unsuitable for most water sports activities and is thus reserved for bathers. The lake is encircled by a two-and-a-half-kilometre path, which passes through woods and meadows. On a hill to the north is the farming village of Leitgering, with a breathtaking view of the Alpine panorama in the south in good weather. Approximately an hour's walk from the lake is the picturesque town of Tittmoning in the Salzachtal. Burghausen with its medieval castle, 15 kilometres away, is also well worth a visit. 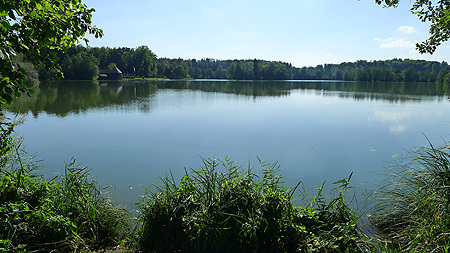 The Leitgeringer See is located approximately 120 km east of Munich, 2 km north of Tittmoning. It can be reached on the A8 motorway from Munich to Salzburg (exit Traunstein) or on the B304 via Altenmarkt.